1. Finding a time for our calls. We have been meeting once every 2 weeks almost without exception. But, with the recent addition of a team member in Europe, finding a time that works all the way from the Bay Area to Singapore is tough. So, we’ve decided to alternate between 2 slots every month. This way, the folks at one end have to give up their Saturday night once a month while the folks at the other end have to give up their Friday night once a while. And, a couple of folks will have to live with waking up at 5am and 630am respectively. 2. Sustaining momentum. Given the awkward timings and the sheer distances between us, it is easy for one person or the other to lose momentum. We’re all working on this on our weekends and the limited extra time we have during our weeks and one call missed can mean going a long time without contact with the team. Momentum is not easy to sustain. 3. Large amounts of communication via email. You know what they say about asynchronous communication. Yes, we know it is not the same. And, yes, we know face-to-face / video communication will be better. Luckily, many of the relationships are strong existing relationships. That helps. Then again, it doesn’t mean it is easy given the constraints. 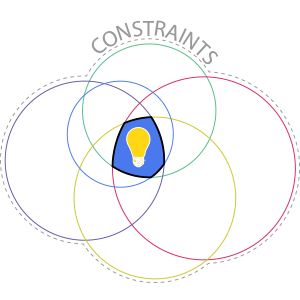 On the flip side, these constraints make things interesting. We face the resistance all the time at Help2Grow. Wouldn’t it be easier to not do this at all? Absolutely. Would it be better? Absolutely not. We’re doing this for reasons beyond ourselves and we’re learning a LOT during the process. Besides, these are all amazing first world problems to have and serve as a wonderful reminder of the need to give back. So, how do we keep the momentum going? Our best recent solution has been to think of it with an analogy – imagine the whole team is on a large boat, can we get 6 people rowing together for a consistent number of hours every week? While we do occasionally see spurts of activity from our team, we realize that there’s immense value in consistent application of effort. So, that’s what we’re working on these days – getting 6 people rowing together consistently. This means we’ve set up systems like vacation and activity trackers so we know in advance when people are going under water and we’ve created an overall management information system (more on this another time) which we use to guide our conversations every call. We might lose people on a call but we want to make sure our systems cover for them. And, one new metric added to the system is.. you guessed it.. whether we had 6 people rowing together this past 2 weeks. Just for this week, let’s make a commitment to front-load our work. If it is due on Friday, let’s get it done by Wednesday. If you only click into gear only when your backside is on fire, here’s to creating a schedule where your backside always seems to be on fire. You and I both know we aren’t going to get out of it. Why, we have already taken the wiser path and embraced it. It’s just going to be less stressful.. and better. And, sure, our attempts may result in failure today. That’s okay. We have a week to get into the zone. We will just try again tomorrow. With a bit of reflection and tweaking, we do get better every day. When Steven Spielberg was shooting the movie “Jaws,” he wanted to create a realistic model of a shark so they could film it attacking people for all the scary scenes. However, this was going to be very expensive and beyond their budget. Faced with this constraint, Spielberg had a new low budget idea – shoot it from the point of view of the shark under water. And, guess what? Way scarier! Similarly, Herman Houser, whose company manufactures ARM chips that power a large proportion of the world’s cell phones, said the chips arose out of a computer chip making project where he gave his engineers no resources. They ended up creating a low cost low powered chip that didn’t really work for computers but was perfect for cell phones. Twitter’s co-founders channeled constraints at a time when there were seemingly no constraints to publishing online. Twitter introduced a 140 character limit that clearly worked. And, lest we forget, Twitter was founded as a result of a two week hackathon. 2) Make commitments. Come back from time to time and revisit your likeness. Does it feel right? Is it you? 3) Define metrics. How do you measure ‘success’ in your definition? In his case, since his purpose was kindness, he always measured it by the number of people he helped. He points out that these metrics are rarely “make more money” or “get a promotion.” Define success and ensure your metrics are aligned. I was intrigued by this chapter as it definitely felt like the most meaningful part of the book. However, unlike the rest of the book, this part seemed a bit cryptic. Now, I’m not sure if Clay intended it to be so but it resulted in a 1.5 year journey in attempting to really understand and apply this. I’d like to share my learnings from this journey with you. Purpose process v1.0. I tried following Clay’s exact process and made a first draft of a list of commitments and metrics. After 6 months of testing, I realized there was something amiss. The hardest part about questions that have an existential component (e.g. what is your purpose?) is that you know when something is amiss but you don’t know exactly what is amiss. Cue: Time for more thinking. I gave myself a break to think about it and got back to “designer” mode. It was time for Purpose process v2.0 that combined Clay’s approach and my learnings from attempting to apply his approach. Purpose process v2.0 – my 7 step process for giving finding and measuring your purpose a shot. Step 1: Visit your own funeral. First, we borrow Stephen Covey’s idea to begin with the end in mind. Close your eyes and imagine you are at your own funeral. Who do you see around you? What are they saying about you? What else do you hear? Step 2: Draw out your likeness. Pick a few arbitrary points – e.g. 30 years, 50 years, 70 years, 90 years and describe your likeness. Who would you want to be at these ages? Describe your future self – how you look, what your personal life looks like, what you do, etc. Don’t restrict this process. For example, I had a funny moment when I realized I kept describing myself as “fit with muscly arms.” Fit alone clearly didn’t do it for me. The thought of muscly arms somehow always brings out a smile. These details matter. b) I chose to think of it as 4 layers (or 4 concentric circles) – Myself, the people I love, the work I do and the impact I have on the world. This is ordered in terms of priority in my case. It doesn’t matter which frame you pick. Picking one is important thought. Step 4: Describe what success would look like for each segment of the frame. Start describing what success looks like for each segment of the frame. Use all the data you built up as you described your likeness. Here is how mine got filled out..
And time spent making a positive difference.. Step 5: Make specific metrics. The next step involves creating metrics that you can track every week/month to see how you are doing. Here is what my “happy self” and “positive difference” section looked like. As you can see, I have a mix of weekly, monthly, quarterly and yearly commitments. I didn’t do that in v1.0 and found this distinction to be useful. Step 6: Track and revise. Set up a recurring invite on your calendar as a part of your week review process. I would suggest checking it every week as it keeps the continuity. Step 7: Make a “why” statement. This purpose exercise is a beautiful way to put together an overarching “strategy” for your life. It fundamentally defines how you approach your life. It helps keeping the big “why” in mind. I have to credit writing applications to business schools for help with crafting my “why” statement. In my case, it is “To build active relationships with close family and friends, to learn, and to make a positive difference in the world.” Having a why statement helps a lot. There’s no easy way to get to it (i’m sorry!). My first shot was a why statement that didn’t work for too long. This has been a result of continuous improvement and involved seeking advice from folks who knew me well. – There is no easy way to get through this process. You’ll have to set aside 3-4 thinking hours on a couple of days and wrestle with yourself as you go through this. But, it is one of those processes that changes the way you think about life. If done once, it helps draw attention to what matters and what doesn’t. I hope you’ll consider it. The clarity you gain at the end of the process makes the juice well worth the squeeze. – It never ceases to amaze me that Clay Christensen did this as a 21 year old. I love his thought process and am thankful to him for sharing this in his book. I know this post was long. Sorry! I hope it was worth it. Every once in a while, we’re fortunate enough to have a person in our lives who challenges many of the assumptions we operate with. These people help us learn and grow by helping us think critically about why we make the choices we make. I rarely mention names on this blog. But, today, I’d like to introduce you all to Ken. Ken not only regularly challenges all these assumptions but also manages to do it in a way that seems non-judgmental. I guess he manages to focus entirely on the idea and makes it a discussion around the concept rather than the person – I’d love to get better at doing that. Many of the ideas on this blog owe their origins to discussions I’ve had with Ken – especially the push over the past few months on process. The “Don’t confuse good results with bad decisions and bad results with good decisions” is a Ken-ism. Thanks Ken, for all you do! Today, I’d like to share with you all Ken’s new venture – PacMe. 2. If you’re living in the US – If you’ve got friends, relatives or siblings living abroad, PacMe is a fantastic way to ship stuff over to them. – Our warehouse and website software was built from scratch by an obsessive, meticulous customer (read: Ken) who receives hundreds of packages per year. – Every incoming package has its own webpage showing a scan of the invoice, photographs of the contents, carrier tracking number, options for “special requests,” and a chat box to discuss any issues. You might think that is overkill, but when you have 10 packages all from Amazon, and they sent you the wrong item in one of them and back-ordered an item in another, this will help you keep them straight! – You can even enter “expected packages” and our system will recognize them when they arrive and put them into the correct consolidation. – You can control all of the consolidation options yourself (e.g. discard shoe boxes), and even fill out your own customs list, or let us take care of everything. One click or ten clicks! We are expert packers, hence the name PacMe. Most packages sent internationally trigger the “dimensional weight” surcharge. Unless you are only shipping fluffy pink unicorns, we will help you avoid that by repacking your items correctly. 1. If you consider giving PacMe a spin, please use the discount code “alearningaday” – sign up fee is $100 per year. This will essentially give you a 3 month free trial worth $40. 2. Once you do sign up and try PacMe, please send Ken feedback on feedme@pacme.com – this sort of business spreads best by word-of-mouth business and Ken would appreciate any feedback you will have. PacMe is also present on Facebook and Twitter. I hope you all find it useful. Here’s wishing Ken and the rest of the PacMe team all the very best on the new venture. 1. Drink more water. The cost of carbonated beverages and alcohol add up over time. Water is largely free, incredibly tasty and, as an added bonus, great for your health too. Easy way to save $35-$40 per week / $1600 per year. 2. Eat food at/from home. If you need a lot of food to be energetic, consider taking a few simple sandwiches and fruits with you. The biggest benefits come when you begin packing lunch. And, definitely eat dinner at home. That can save about $140 a week / $7280 per year. 3. Develop a taste for low cost fun. Every weekend needn’t be expensive. Try board games, pot luck dinners, and simpler gatherings. Yes, I recognize that this list appeals more to introverts. Mix it up a bit perhaps. 4. Allow space in your budget for some guilt free spending. This way, you keep your willpower reserves intact and also enjoy your money. 5. Spend money where you spend your time. If you spend 12 hours on a computer desk – invest in a nice screen, a comfortable keyboard, and a nice mouse. Don’t skimp on stuff that you will use a lot and definitely don’t skimp on tools that help you get more done – e.g. if you can clear more emails or listen to more books on your commute on a tablet, invest in one. Similarly, don’t compromise on a comfortable duvet. If you don’t sleep well, the rest of your day is useless. 6. Invest in your long term happiness by spending on great experiences rather than things. Go for that iconic trip to the Canadian Rockies or that road trip to the Gold Coast. They’re memories that will stay with you forever. You get used to regular luxuries (e.g. an expensive car) real quick. 7. Invest in your learning. Don’t skimp on a good education or books on a regular basis. These things generally pay themselves forward with better jobs and higher earning potential. 8. Give. Giving helps us gain some perspective about how much we have. Happiness is key to spending wisely. 9. Invest for the long term in indexes. I gave estimates on the first two items just to illustrate the power of long term decisions. Assume you have around $10,000 this year by saving on food and water and invest in an S&P 500 index that Warren Buffet recommends, that will be worth $102,000 in 40 years assuming a standard 6% real return. Imagine if we did this every year and if the amount were bigger with the aide of low cost fun and other savings. Money is just a tool. We just need to learn how to use it well so it doesn’t get in the way of our happiness. Live frugal by investing in things you really need. Spend consciously. It may sound a bit boring.. but, not having to worry about whether you have enough money for this or that sure is a lot of fun. I think our body’s poop process is awesome. I know we have an aversion to talking about or thinking about poop. Allow me to explain. Let’s think about the process for a second – we ingest a lot of material during the day. The body takes it in, makes the best out of the mixture of good and crap we normally eat, and then kicks out the crap. It is an incredible process – one without which it would be impossible to stay in good health. The big question for us is – what is our mental poop process? Our minds aren’t different – we ingest a mixture of good and crap information/ideas/opinions/thoughts every day. Unlike with food, it is completely up to us to design a process which allows us to filter what works for us and what doesn’t. Some do it with quiet walks or bike rides, others do it with meditation, and some weirdos do it by writing a blog post on what they learnt every day. The fact remains that a mental poop process is helpful and goes a long way in helping us stay mentally healthy. And, it is up to us to design one.